Probably all of that, to be honest with you. I thought our hockey team got better through the series. Obviously, Game 2 was different just because we were missing Muzz and Drew and Derek. Drew’s a big part of our team, and I think the guys came in and played hard. I thought we got a little bit better the first game at home, and I thought tonight was our best game. We probably created the most quality chances and just didn’t finish offensively. When you limit the other team, the amount of scoring they had, you usually give yourself a chance to win, and tonight we had some really good looks with the right people with the puck on their stick there. Fleury was really good, and they check really well. We created opportunities, but at the end of the day, you’ve got to take advantage of those opportunities, and you want to limit scoring chances, but you need to put the puck in the net to move on this time of the year, and we obviously didn’t do that enough. I think if you look, we talked about this all year. We put in a lot of work this year to build our team to get into the playoffs, but not just to get in – to build something that we could sustain success in the playoffs. I think we’ve taken a step towards that, but obviously we’ve got lots of work to do. I think some of our young guys really pleased us in how they performed this time of year. I think we have some guys that were asking for more responsibility that need to take more responsibility. 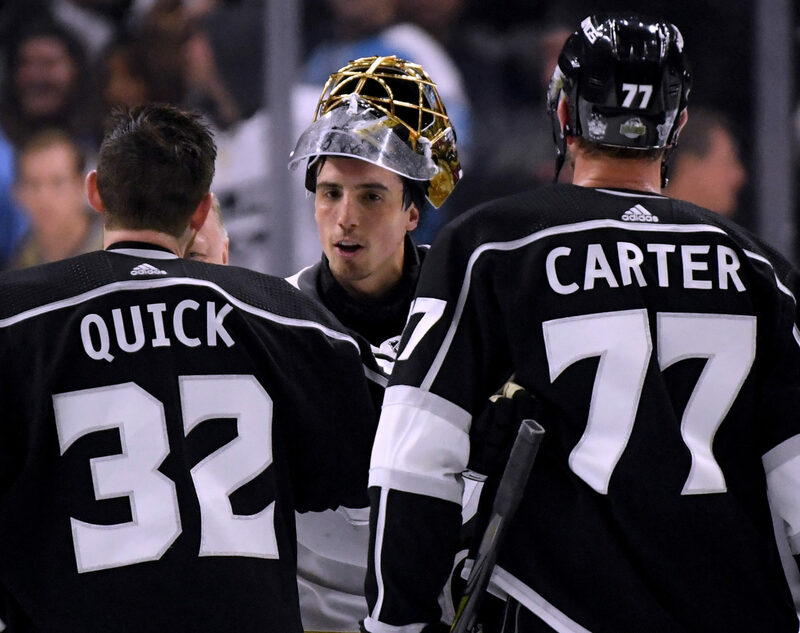 Your key guys – Quickie, Kopi, Brownie, Carts, Drew – those guys were trying to carry the load. I just think you need a push from the middle sometimes to get over the hump against good teams like Vegas that are really deep. We’re always going to pride ourselves on being good defensively, but we’re going to pride ourselves on winning hockey games, and we need to win hockey games this time of year. Well, it’s a good lesson for us, right? Just because details matter all the time. Start of hockey games, faceoffs, special teams, discipline, line changes. At the end of the day, you’ve got to find something that just gives you a little more than the other team this time of the year, and we didn’t and they did. They deserve a lot of credit for the way they played, and they deserve to be moving on, but again, I think there were some good lessons for us to be learned along the way. I didn’t say a whole lot, to be honest with you. First and foremost, remember this feeling, because it’s not a good one. The guys, I just thanked them for their commitment and effort this year. We’ll talk lots more when we get a chance to reflect. It’s not the time to start breaking down the game and the series. We’ve got a lot of opportunities to sit down and talk to our team and figure out ways we need to get better individually and collectively, but I do respect this group and what they’ve done this year in terms of the commitment to the team. This team, the commitment over the summer last year was tremendous. Training camp, going to China and coming back, and now they’re through a long year with injuries and adversity along the way, I think this group was totally committed to the cause, and as a coach, that’s all you can ask from your group. I actually thought the last two games were our best two of the series, so obviously getting Drew back helps. But, the thing that still bothers you about Drew getting suspended is that nobody wanted to get back in the playoffs more than Drew. Nobody wants to play this time of the year more than Drew, and nobody’s put more work and effort in this year, the whole year, than Drew, and we take him out of a game there, that’s unfortunate, but that’s part of the game. I think guys came in and played hard, but Drew came back in, and like I said, if you looked at our series, we played better as the series wore on. We just didn’t get the results that you need this time of the year. We need to get more from more to get on the right side of being close. I keep saying that, but that’s what it is. Playoffs are tight. You’ve got a 1-0 lead that if you make it 2-0, it changes the outcome of the game. You never want to lose a player of Drew’s caliber that plays the minutes he does in that situation, but he did. A lot of the guys played hard, and we didn’t do enough to win the series. Well, they’re a good team. They have been all year. What’s interesting about Vegas is that they’re one of the higher scoring teams in the league, and we limited their scoring, but we didn’t create enough. I thought we created chances tonight. I thought we created enough chances but we didn’t capitalize on our chances. Obviously, there’s more you can do. You can bear down around the net, you can take the goalie’s eyes away, there’s things you can do, but we didn’t do it, so we’re not going to sit here and make excuses. Vegas is a deep team, and I think the coaches have done a terrific job with that team building an identity, and you can ask me right now – they deserve to move on. We don’t. No, I thought it was exactly the start we wanted. We wanted our guys to come in and be totally emotionally invested with a level of discipline necessary this time of the year. I did think we got off page a little bit in the second period. Maybe that comes from frustration. I don’t know. I thought we really put pucks behind them or drove pucks around them that forced them to spend time in their zone. I thought we turned pucks over in the second period and allowed a little too much rush game, and that takes energy out of your team, because now you’ve got to chase a puck back to your zone. I didn’t sense any frustration in terms of not being ahead. That’s the way you’ve got to play the game. You’ve got to play 60 minutes, and you do good things for the length of the hockey game that usually get the results that you want. Tonight, we didn’t, but I think the intention was there.